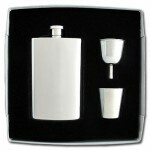 Designer high polish stainless steel flask in convenient 4 oz. size personalized with your choice of color and design. 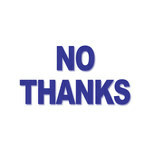 Create your very own look! personalized - select cool design, vibrant color accent and optional engraving to create a very chic flask for purse or pocket. carry whisky, vodka, tequila, gin, bourbon, Scotch, and other alcoholic drinks. 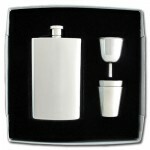 4-3/4" high x 2-3/4" wide x 3/4"
can engrave flask above or below design, or on back with quotes, name, date, etc. Red heart pocket flask with aluminum is a romantic gift for girlfriend. Cool alcohol flask with endless Celtic design accented with ocean blue is a meaningful gift to tell a loved one that distance won't change how you feel. Chinese friend character flask in iridescent rust is a great way to celebrate a lasting friendship. Cute cupcake flask accented with iridescent hot pink is a fantastic gift for your special muffin. Custom flask with ducks and tropical blue will be appreciated by a hunter on a cold morning. Irish shamrock hip flask is accented with green aluminum - great for partying on St. Patrick's Day or all year long. The flasks are very nice quality and very pretty. I would definitely order from this website again.